Dan McGaw is a seasoned veteran of the growth marketing and analytics space with a passion and talent for helping companies extract and interpret the right data to grow their businesses. 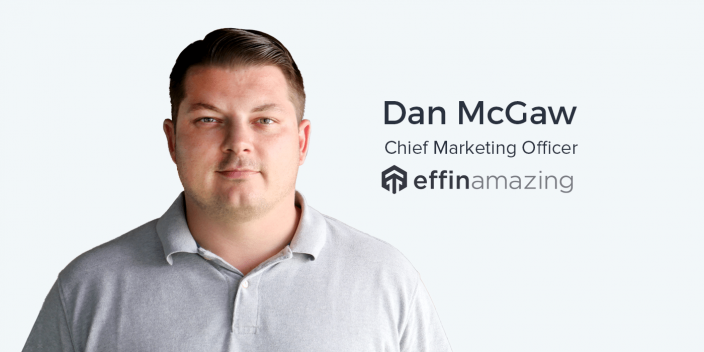 He is currently the CMO and Founder of Effin Amazing, an analytics and growth consultancy specialized in using data and analytics tools to increase mid-funnel and bottom-funnel conversion rates. Dan previously served as the Head of Marketing as Kissmetrics, where he oversaw marketing strategy for the brand. He’s also spent time as a mentor at 500 Startups and works as a CMO consultant for a number of high growth companies. There are a number of popular A/B Testing frameworks based on “ICE,” or Impact, Confidence, and Ease. Dan and his team identified that a missing components was Velocity, or the speed at which a test can be completed with statistically significant results. Velocity could, however, be replaced with something else. As an example, Intercom uses a “RICE” framework featuring “Reach.” Regardless of which framework you use, make sure to consider all of the factors and variables that might affect successfully running an A/B test. It’s difficult, if not impossible, to always and consistently produce a hypothesis that is validated by your A/B test results. However, an invalid hypothesis still presents learnings that are valuable to use as marketers. “One of the great things in our organization is we support failure. A mistake is not necessarily something that is always bad. It’s something that we use as a learning chance. And that’s the same thing with hypotheses. Our failure rate is 72%. We know as an organization that 72% of the time, we’re going to have a test which is a loser. Even if you consistently run tests that invalidate your hypotheses, at the very least you’re learning what doesn’t work for your product and your audience. The sheer volume of opportunities and channels we as marketers have available to drive awareness and acquisition can be daunting and time consuming. But this challenge extends beyond your growth channels, even working it’s way into the operations of your marketing organization. In addition to using it for running successful A/B tests, the VICE framework can be used for other marketing decisions, including hiring the right person. Ander: It’s awesome when there are conferences here in San Francisco and awesome people coming into town, and one of those people makes time to come by Instapage HQ right across the street here from AT&T Park. Today, that guy is Dan McGaw. Dan, pleasure to have you here. Dan: Thanks for having me as well. Ander: Dan, you’re currently the CMO of Effin Amazing, an analytics and growth consultancy, and I definitely want to get into some of the things you’ve done previously including time as the Head of Marketing at Kissmetrics, a growth mentor at 500 Startups, and a whole bunch of other impressive experience. But first, what is Effin Amazing? Tell us about what you guys do. Dan: Yeah, that’s a great question. We’re an analytics and growth consultancy. What that really means in most cases is obviously we’re very data-driven in the fact that we help people set up Kissmetrics, Amplitude, MixPanel, Google Analytics, things like that, and then we help them take that data and really start to drive their business forward. From a growth perspective, we’re focused on everything after somebody comes to your site, so we don’t do SEO or PPC or things like that, but once you get somebody on your site, we work on the conversion rate optimization, marketing ops, marketing automation. Ander: And when you started Effin Amazing, you were the founder of it as well, right? Dan: Absolutely. I founded the company by accident, and it hasn’t stopped growing. Ander: Awesome. When you started Effin Amazing, was there something specific that drew you towards that post-acquisition experience, or at least after that very, very top of the funnel? Dan: Yeah, I guess I’m just not as interested in driving traffic from a content or PPC or SEO perspective. I find those things to be all very fun and interesting. It just wasn’t where I was really excited. I really like digging into data, so where the company really started was in the analytics space, but we’re also really good at everything after somebody gets to your site. It kind of naturally went in that direction just because that’s where more of my experience has been. But at the same time, as the CMO of Effin Amazing, I’m a part-time CMO at multiple companies, where I’m advising SEO and PPC programs and things like that. Dan: We just don’t have a lot of fun doing it, and I guess that’s just because you don’t know enough about the customer from PPC and SEO. They’re just anonymous people. I like it when I know what their email is, and I start enriching their profile and collecting more information. To me, that’s more exciting. Ander: Yeah, and it’s interesting you say that because obviously it’s just a preference. It’s not like one is better or more important than the other or anything like that. You have to be doing both to grow your business. Ander: I love that very, very top-of-funnel stuff. Ander: For totally different reasons. It’s because I don’t know who it is. Ander: That’s an interesting challenge to me. But yeah, I really, really like that you have that perspective and that you do have that focus because that’s incredibly important, especially when you’re working with all these analytics tools. Now, you’ve got this pretty robust background working at Infer, Kissmetrics, and a number of other companies. What would you say is a good way to maybe summarize the story of what led you to where you are now? Dan: Yeah, absolutely. So, it really all started when I was 14. I started my first company as a young kid. I started one of the first online booking agencies way back in 1998 or 1999. I’ve always been an entrepreneur. From a workplace perspective, I’ve just kind of always gone where people want to have me, and Kissmetrics was a great opportunity, so I took that role. It was an amazing experience while working at Kissmetrics. I kind of have just fallen into everything I’ve done. I haven’t exactly been very intentional about my career, like some people try to be. A lot of people go to college, they get out of school, they’re very intentional about what they do with their career. I’ve been very haphazard in the fact that I’m like, “I don’t really care. I want to have fun,” and it’s taken me on the journey. Ander: Yeah, I used to be a radio DJ, and here I am now doing marketing, so there you go. Dan: Yeah, it’s been a blast. I mean, as a consultant, I get to work with a ton of great companies. You mentioned Infer. I didn’t actually work at the company; they’re a client of ours. Dan: But at the same time, we’ve gotten to work with so many great companies—everybody from Infer to leaving Kissmetrics. I’m a consultant for Kissmetrics, so I still have the opportunity to work with them and a lot of other cool brands. I can’t really complain. It’s just been a lot of fun. Ander: Yeah, and there are certainly a number of companies on there that would indicate how much fun you’re having. Dan: Yeah, for sure. We add all of our clients to my LinkedIn page because I get a lot of views on LinkedIn, so it definitely helps. Ander: Yeah. You’re quite the networker, I will say. Ander: What would you say is your marketing philosophy generally speaking, and how has your marketing philosophy changed or evolved over the course of your career? Dan: Yeah, that’s a great question. We have a general strategy which we would have for 6 or 12 months, but we don’t have a direct plan all the time. We tend to be very, very agile, especially at our company, so every week can be entirely different because we’re trying to test and figure out what’s really going to grow. We’re always looking for exponential growth compared to incremental improvement sometimes. Ander: This was probably back in the days of keyword stuffing perhaps? Dan: Absolutely. Definitely. For sure. Ander: In many cases, you had to play that game to be successful, yeah. Dan: And even now, I’m not afraid to still scrape. We actually have one of the largest databases of growth hackers and marketers in the world right now that we recently have acquired, so we’re not afraid to use that as cold outbound emails, right? We tend to be very, very hacky as much as we can. How can we hack it and be a minimal, viable product or minimal, viable test and push that stuff out? Ander: Sure. And how has your marketing philosophy changed specifically since you accidentally fell into this consulting position? Dan: Yeah, consulting is a different style of marketing, for sure. We bring a very SaaS-style of marketing to consulting. I’m used to a lot of self-service products. In my time at Kissmetrics, part of my task being hired there was to make the product more self-service compared to in-your-face talking to a sales rep. Even at CodeSchool.com, it’s completely self-service. There’s no sales rep. You have to self-service everything. Consulting is a huge sales process. I’ve had to definitely change the way that I think about my marketing because it’s more about “How do I get somebody onto a phone call?” compared to “How do I get somebody to the next stage of the funnel?” I have to be a lot more relationship- and data-oriented from who the person is, compared to “What do I know about their business? What do I know about their entry point?” This is a lot more about having to create a relationship with somebody and, in essence, marry them for six months. Ander: Or however long you’re going to be working with them. over two years. My wife calls the founder of that company basically my work husband because I spent so much time with him on the phone. Ander: I think we’ve each had a work husband or wife at some point. Dan: Absolutely. You should have multiple. I mean, at least you can have a little bit of fun on that side. Dan: But, I would have to say the biggest change is just the sales process… I can’t remember who the famous sales guy is, but there are like 63 things that you need to know about somebody during the sales process. I can’t remember who that person was, and it might not be 63. It’s like 64, but anyway… Very much my marketing has changed to “How do we personalize and be authentic?” compared to before, where it’s like “Oh, we use first name—great!” Now, we really have to sit down and think for ten minutes before we send that email or before we try to send out a marketing blast. Ander: Gotcha. I’d like to talk about something that you call the “VICE” framework. Ander: I know it’s something that you are champions of over at Effin Amazing, and I think it’s something that is basically your brainchild. What is this framework? I know that it involves A/B testing. Ander: I talked about it a little bit in the introduction to this episode, but obviously, it’s going to come much better from you. Dan: Absolutely. One of the problems that we noticed in A/B testing a long time ago was that there was no way to prioritize your tests, and there was no way to really be structured about it. Sean Ellis over at GrowthHackers.com, he and his team created the “ICE” framework, which is Impact, Confidence, and Ease. That’s been used in many, many different places, but the one thing that we really saw a problem with was that we focus a lot on high-velocity testing. We want to be able to create growth really, really quickly, and we want to be very, very fast about our tests. We want to get as many learnings as we can in a short period of time. On a normal website that’s doing, let’s say, a million visitors per month, we’re trying to run upwards of 15 to 20 tests on that website if we have the opportunity to. Now, the problem was when we looked at the other frameworks out there—and there are multiple A/B testing frameworks including ICE, and there are a couple of other ones. Ander: All appropriate for different cases. The big difference with our framework compared to anybody else’s is that it’s integrated with Google Analytics as well. What happens when you work with us is we integrate it into your Google Analytics account. Velocity is actually set based upon the amount of traffic that goes through a page. So, Velocity is “How quick can a test be completed?” If a page is getting, let’s say, 10,000 people per week, obviously, we can hit statistical significance pretty quickly. Dan: We have some manual levers in there as well. For an example, Velocity can’t always be done in one week because you have a long sales cycle which takes six weeks to cover, so we have to manually update that Velocity. Impact—obviously, Impact on revenue, which is actually done based upon the page value in Google Analytics. If you’re using Google E-Commerce, we can actually use that page’s value in your funnel to set the Impact score. Once you have those four scores, it gets added to the model, totaled up, and then whatever is the highest scoring test is the first test that we run, which is usually the easiest test. Ander: I see. So, you guys are literally quantifying Velocity, Impact, et cetera. Dan: Yep. Velocity and Impact are quantified based upon your Analytics data. For people that aren’t using Google Analytics E-Commerce or they’re not set up in that manner, we actually have a manual way that we plug in data from other tools, like Amplitude or Kissmetrics—any of those things. Dan: That way, if somebody else on your team is a little bit better at picking winners, their score stays normal, and then you actually get penalized for being a loser. Sorry—I don’t mean to call you a loser. Ander: It’s a game among the marketing team. Dan: Absolutely. I’ve never looked at it in a game fashion, but definitely, we could take it that route. Dan: That would be rad. Ander: Yeah, that’s really, really interesting, and I want to talk more about the theory and the function of this VICE framework. in our organization is we support failure. A mistake is not necessarily something that is always bad. It’s something that we use as a learning chance. And that’s the same thing with hypotheses. Our failure rate is 72%. We know as an organization that 72% of the time, we’re going to have a test which is a loser. Dan: “So, why don’t you look at the way that your patterns are working and then change the way you do it?” And a lot of people don’t know better, right? They’re going to say, “The buttons always have better tests,” or the headline section, and they pick these arbitrary things. But that’s the reason you can’t do testing for 3 months or 6 months and just quit; it’s something you should be doing all of the time. Ander: Super interesting to think about, and we could go into the philosophy of that for a long time. But let’s shift back to the VICE framework. What was the moment that you realized Velocity was such an important component of this equation? Dan: It was probably working on a client of ours, Forks Over Knives. We had a normal framework. We were using ICE originally. The problem with Forks Over Knives is that they have nine different products that we have to get customers through, and it makes it really, really hard to prioritize where we go next. So, it ended up getting build on top of that Velocity score because we could actually understand and then have a better cadence to our testing as well. We could know that a test would be completed in a week or two weeks, and then that helped us better prioritize our tests. Ander: Gotcha. Now, something that I think about on a fairly regular basis (and part of my own A/B testing philosophy), is that a lot of people say, “What are the best practices for post-click landing page conversion, for conversion optimization?” And yeah, of course, there are going to be some things that are important, like a call to action needs to be visible. It needs to be something that you can actually see, et cetera. Ander:. But I tell a lot of people that in many cases, that there are no best practices because every brand is different, every product is different, every user, and every persona is different. Ander: Is that something that you agree with or do you think that’s a stretch? Dan: 100%. The “best practices” get thrown out the window once you start testing. You definitely want to start with the things that have typically worked across the internet, but what works for my business is going to be 100% different from what works for another business. The demographics are so different across every business, so the persona of the brand itself is so different that one test that might work for you is not going to work for somebody else. There’s a client of ours, RealThread.com. They’re a custom T-shirt printing company with amazing shirts, but their target market is a lot more designer, hipster, and totally different than what you would expect from a best practice. When we rolled out our A/B testing with them, honestly, most of our tests just never won because you couldn’t go with what a best practice was. You couldn’t go with what you thought. You really had to take the frame of mind that “This is a brand; this is not just a product.” So, there aren’t best practices all the time because every company is so different. Ander: Yeah. And another thing that also makes every company so different are the other components within their marketing organization, within their marketing strategy, methodologies, their marketing stack, whatever it might be. I’m curious: Is there a way that we can take this VICE framework and apply it to other things within our marketing organization beyond A/B testing to include other channels or processes? That can include maybe some more top-of-funnel stuff, even though I know that that’s not what you traditionally work with. However, it could also include hiring the right people, deciding what you’re going to focus on next, or whatever it might be. Dan: Yeah. I definitely would recommend using the VICE framework in anything inside of marketing or even inside of the business. We’ve been experimenting with that inside of our business and a few of our clients to see how we can better prioritize our marketing efforts. At a stereotypical company, you only have so many resources, and you only have so much money, so if you don’t have a way to prioritize, and you don’t have any way to really run any type of model, you don’t really drive the business forward. A lot of businesses only have small growth because they can’t prioritize, so using something like the VICE framework would dramatically help you be able to prioritize. Now, I wouldn’t say put your A/B tests and your marketing framework in the same framework, obviously. But when you say, “Hey, we are going to have ten marketing campaigns that we want to run. These are our ten ideas.” Go grade all of those on the VICE framework. Once again, Velocity—how quick is that campaign actually going to run? How big of an impact is that campaign going to have? All of those things will help you have better marketing experiences earlier on. Ander: What about something a little more abstract, like hiring the right person? Dan: I think it’s a great idea, and it’s actually something that we used in our recent Project Coordinator hire. We actually used the VICE framework to prioritize that. Jamie, when she listens to this, will actually know that that was part of her thing because what we were able to do was figure out the Velocity and how quickly we were going to be able to train that person, how quickly they were going to be able to get into the role. So, it does work in abstract things. I’m not the right person to know all the other frameworks. Dan: I know there’s a grading framework out there for HR, for interviewing. We just thought we would use our own models and see where else we could put that to work, and it’s worked in a lot of different places. I mean, heck, I need to buy a new car sometime this year, so I might want to look at using the VICE framework in that. Ander: Awesome. And even if we’re going to go a little more abstract, what if you have a channel that is more difficult to to measure? I’m thinking of billboard advertising as one example. Is there a way you can incorporate this VICE framework into something as hard to work with as that? Dan: I would imagine so. I don’t think billboards are that hard to track all the time. You can definitely get some kind of interest out of that. We did billboards for another one of my companies, and we were able to track that based upon the amount of sessions that came from that region as well as better understand the promo codes, which were used on those sites. So, every single billboard had its own actual URL on it, so it’s wasn’t just like EffinAmazing.com/1; it was literally EffingAmazing.com, and you had FunAmazing.com. Obviously, we didn’t use it for Effin Amazing, but I’m just using that as an example. Dan: But I would definitely say that you can use a framework like that to figure out what’s working from a billboard perspective. Tracking is always going to be difficult, but you have to ask people where they heard of you, right? That’s not very hard to do. It’s really, really simple. The best tactic that we actually have rolled out for a client on asking “How did you hear about us?” is not in the sign-up process. It’s in the welcome email. So, when you get a welcome email, the best place to ask a survey if you want to know anything about your customers is that first email because you have such a high open rate, such a high engagement rate. If you put six buttons in there that are your six main things, they click the button. It takes them to the next page. You can ask another survey, you can offer another offer, or just get them back to the product, but you measure the number of clicks off of that, and that answers your survey. So, we have a 90% response rate with one of our clients in their welcome email, which is amazing, and this is information we would have never known. Dan: So, not off of email sent to click, so it has a 40% open rate, and then from those 40% that opened, there’s a 90% rate of people that click on one of the survey buttons. Dan: Yeah, it’s awesome. We rolled it out across multiple clients now, because it’s just so effective. It makes it really, really easy to get information. Back to the billboard… Once again, you can use VICE to measure anything. I think what’s interesting is anybody can create a framework. One, you can go to our website and download the VICE framework for free. It’s really simple. But you can change Velocity and name that whatever you want, right? Just like Intercom has RICE for Reach, Impact, Confidence, Ease, do the same thing. Come up with another acronym. As long as it sounds cool, people will download it. Dan: We definitely got lucky with the Velocity. Ander: Yeah. VICE sounds awesome. Dan: It sounds great. We tried Speed. S does not work—SICE is confusing. We tried DICE—that did not work. So, VICE—we got lucky. Now I think we’re going to do a Miami Vice theme on it and see. Ander: I like it. Given that you live in Florida. Dan: Right?I have a Miami Vice shirt on today, and it’s kind of pink salmon. Ander: Sure. Yeah, I’d say so. Dan: Yeah, it just worked out to have a good name, too. Ander: Now, those last three letters: Impact, Confidence, and Ease. Those have got to stay, though. Dan: Those don’t have to. You can obviously change the word to mean whatever you want. With Impact, you could call it Revenue, so you could change the acronym of course. But yeah, I would leave ICE alone. I would leave VICE alone and go with that. Just keep it simple—steal what I make. That’s how everybody becomes famous is by stealing other people’s work, so just do it. It works out great! How is marketing changing? What do you see is going on in the marketing space as a whole? Whether or not it relates to VICE or Effin Amazing, what do you think the future of marketing is going to look like? Dan: I think everybody is going to give a similar answer to what I would, which is the fact that personalization is becoming super, super powerful. Everybody wants to talk about artificial intelligence and all these machine-learning algorithms that are really, really good. At the end of the day, we can program the same exact thing into an email using IF statements, such as machine learning. Machine learning and artificial intelligence will be able to help accelerate what type of personalization we do. At the same time, at a certain point, how far do you go where it becomes too creepy with personalization? But that’s really where everything in the marketing place is going right now. So, when you think about anything B2C—for example, Banana Republic—is extremely specific on the images that they show inside of their email based upon gender and based upon credit card habits. My emails are tailored to me. Target does this at scale better than anybody else. If you get Target ads in the mail, and you read your Target ad, and then you go next door to your next door neighbors’, there’s a 50% chance that they’re going to have a different ad in there. It is not going to be the same. Dan: Because they track every single person and every single dollar they spend. That’s the reason when they got hacked with their credit cards, it was such a big deal because they do track every single credit card, every transaction, and then they map multiple credit cards back to the same family. Marketing is going to get hyper-focused, hyper-personalized, and at a certain point, people who cannot market and are just spamming are not going to be relevant anymore because it’s going to be just too easy to personalize. Ander: Right. That actually reminds me. I want to say a few months ago, I was on a bus, and I was just browsing through my Facebook newsfeed on my phone, and I saw this ad. I didn’t think anything of it, and then I look up, and I saw a billboard for the same product. Ander: And then another thing that I heard. This is a crazy story. One of my colleagues here, their husband was at some department store. It was Nordstrom or something like that. And, they picked up a shirt, looked at the shirt, put it back, and saw an ad for that shirt later. I’m wondering if that’s going to be something that we start experiencing on a regular basis both as marketers and consumers—that level of precision targeting. Dan: Absolutely. I used to own another company called Fuelzee. We were a mobile app that helped consumers find cheap gas at gas stations. We were working on beacon technology, so we could understand “When you pass a gas station, at what times are you passing that gas station?” so we could serve relevant ads to you at that same exact time. For example, you pass 7-eleven at 7:30 AM every day. When you drive by, there’s a beacon on our app that is registering with the actual 7-eleven. We then serve those targeted ads to you at a specific time, but that is now getting pushed to the limit of the fact that people are aware we’re using smart beacons, and smart Bluetooth. That billboard you saw? That might not have been a coincidence, the fact that Facebook knew you were near one of those beacons because beacons can work for a couple hundred yards. There are a lot of different ways that this technology is being used—even in the use case of a shirt was picked up. Beacons are becoming so flexible that they can really understand what’s going on in a given space. For an example, look at Motion Technology. You might have seen Amazon’s new store. Dan: It’s a little creepy, and it’s a little intrusive, but that’s really the crazy personalization that I’m talking about. I guess I could have taken it to the real tech behind it, but beacons in your phone know everything that’s going on. Target knows everywhere you go inside their store. That’s how they know to serve you what ads. As long as you have the Target app, everywhere you go inside that Target store, they know every single product you walked by. There are beacons throughout the entire store. Dan: They’re in billboards. They’re all over the place. Ander: This is a whole other conversation we don’t have time for, but the implications of that with the Whole Foods acquisition is mind-boggling, to say the very least. Dan: Yeah, it’s going to be an awesome deal. So, with all these changes that are coming, what do you think we as marketers can do to keep up with everything? There’s so much to pay attention to. There are so many blogs that come out every day with so many new frameworks and new technologies. What can we do to stay up to date, and to stay relevant? Sometimes we get too far ahead of ourselves. Going back to the conversation about what has changed in my marketing philosophy, I used to always be the innovator on the next, new, hottest tool, but what I really started to notice was that it just caused distraction. So, I tend to be a month to two years behind some other people in the fact that I’m trying to stay focused and make sure that we deliver value. It’s really hard to stay up to date, and I think people put too much emphasis on trying to be on the bleeding edge. When you think about the general marketplace consumers, the people that aren’t involved in the internet, they’re typically way, way behind us. So, if you’re in a B2C company, you want to be innovative. But at a certain point, are you losing by being too innovative and trying to always be on the bleeding edge? I think there’s a heavy balance that you have to put on that, but the #1 place where you’re probably going to get the most value is off of the internet. I think most conferences I go to are overrated. I think they’re good, but I think a lot of them are overrated. I think there’s a lot of great stuff that’s put on Reddit and Hacker News because at least it’ll bubble up to the top. Same with GrowthHackers.com. At least bubbling up to the top is helping you. I definitely think where it’s user-curated is a lot more helpful. If you’re trying to stay up with all of the newest things, that is your best way to do it. Product Hunt would be another great example of that. Ander: I love Product Hunt. Dan: Anything that’s user-curated I think is way more powerful. Don’t get me wrong—I know how to game Product Hunt. If I want to get 2,000 upvotes, I can get 2,000 upvotes. It’s a way better way to do it. I wouldn’t say just go read Mashable, right? Well, who the hell reads Mashable? Anyways, I wouldn’t say just go read one blog, but go read the Instapage blog. Haha. Ander: Yes. Our blog is pretty good. I mean, we’re putting out new content every day. Dan: It is pretty good. Ander: And, of course, listen to some more episodes of this podcast. Dan: Yeah. Please, listen to the podcast. Ander: All right. Well, on that note, it has been awesome having you on the show. Ander: You just got in here from Florida. You’re speaking at The Growth Marketing Conference tomorrow. Ander: Our VP of Marketing, Saranya Babu, is speaking as well. Hopefully, you guys will try to catch a little bit of each other’s talks. It’s been awesome having you on, Dan. How can people check out what you’re doing and what Effin Amazing is doing? Dan: Yeah. The biggest thing is go check out EffinAmazing.com—really, really good place to get a lot of resources. We have a bunch of great stuff there. If you’re interested in downloading the VICE framework, just Google “Effin VICE framework,” and it will be one of the first results you get. But there are a lot of great resources on our site, so I definitely recommend you check that out. We have A/B testing tracking sheets, which nobody else really has. There are lots of really, really helpful materials on the site. Ander: And I’ve seen that stuff as well—I can vouch for it. Dan: Thanks, bud. I appreciate that. Dan, once again, thank you so much. I’m sure we’ll talk to you soon.